Nicki Minaj attended the Philadelphia 76ers game on Tuesday at Wells Fargo Center in Philadelphia with Meek Mill and his son. 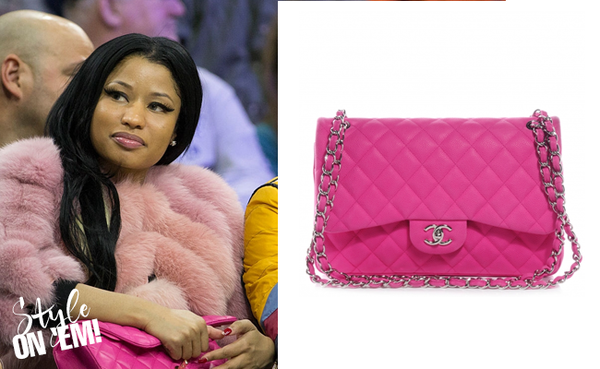 She carried a Chanel Iridescent Caviar Maxi Double Flap Bag in Hot Pink. This chic shoulder bag features silver chain link shoulder straps threaded with pink leather, and a front flap with signature CC turnlock closure. STYLE ON 'EM: Nicki Minaj in Jimmy Choo 'MB Classic' boots.